Rain stopped at just the right time for a Bank Holiday community celebration in Heaton that raised £100 for the Sir Bobby Robson Foundation. Residents of Coquet Terrace came together on Sunday (3 May) for a barbecue at Newcastle University’s Medicals’ Rugby Ground, which is at the top of their street. Bringing their own food, they made donations to the Sir Bobby Robson Foundation, and Medicals’ provided the barbecue facilities under the cover of its stand. Around 50 people attended and the local children played games on the pitch including rounders, cricket and football. There were also spirited sack and three-legged races and a game of musical statues that everyone joined in. Before the event, in recognition of VE Day (8 May), children planted a cherry tree with help from Ian Walker, Newcastle University grounds manager. The cherry trees around the ground were planted in 1947 to commemorate the members of Medicals’ Rugby Club who died in World War II. Event organiser, Bill Corcoran, says: “We thank Ian, Medicals Rugby Club and all at the university for allowing us to use their facilities for this community event. The children had a fantastic time playing on their beautiful fields. “We wanted to mark the years of peace and reconciliation since VE Day and planting a tree to grow and blossom seemed the best way to symbolise that. 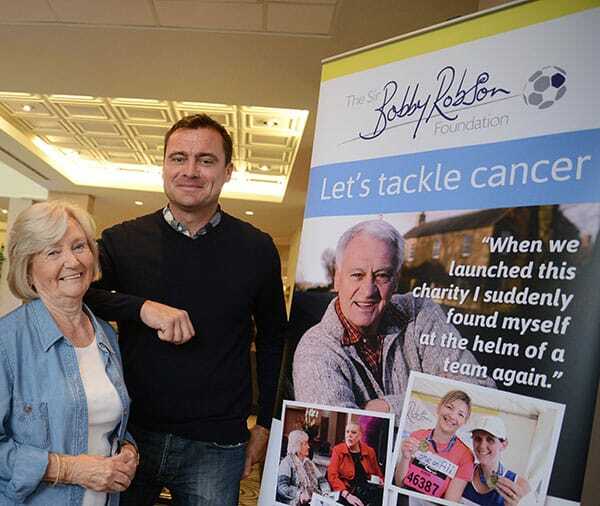 “And we chose to support the Sir Bobby Robson Foundation as it changes lives and inspires people, and is just up the road from us in the Freeman Hospital.